Hi and welcome to the June edition of Perry's Property Update for Real Estate Wollongong. This should have been a video but the early arrival of our beautiful baby girl took priority. The latest Illawarra Regional Information Service (IRIS) report shows that median house prices in the Wollongong Local Government Area (LGA) for the year to March 2012, have weakened by 3.2% to $433,500. 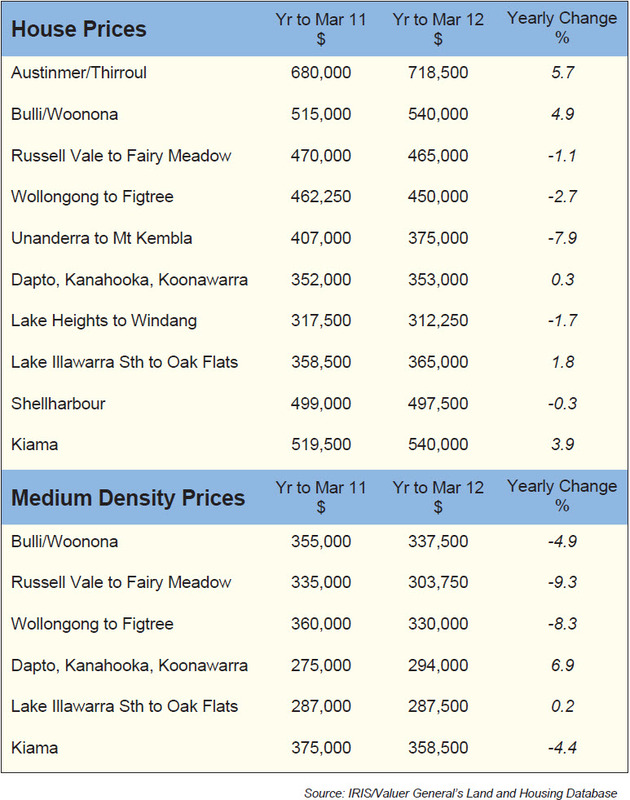 To see how your suburb has fared please see the table at the end of this page. According to RP Data, this negative growth has occurred despite the interest rate cuts started late last year, and is the worst result for housing prices since 2008 during the height of the Global Financial Crisis. Consumer sentiment data released this week by Westpac show only a very small increase in consumer confidence with the index rising from 95.3 points in May 2012 to 95.6 points in June 2012. The interest rate cuts have not yet had any substantial effect on consumer attitudes. The NSW State Government has announced incentives for first home buyers and purchasers of new homes. The aim of these incentives, along with lower interest rates, is to encourage first home buyers back into the market. At Fanning Real Estate, we have noticed that it is becoming more and more important to price your property correctly when trying to sell in this market. If the property is not priced properly from the start, it could take twice as long to sell, and you may have to settle for less. In the rental market the median rental price rose by 2.6% for houses to $400 per week but remained stable for units at $300. At Fanning Real Estate, the last quarter has shown that most of our rents have remained stable at current prices although some properties have had low demand. However our figures for the 12 months to June 2012 show that the average rent for properties managed by Fanning Real Estate has increased by 4.9%, more than double the increase of the entire rental market. Well that's it for another edition Perry's Property Update for Real Estate Wollongong.